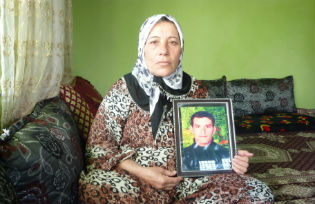 Photo of Zilfo Alma holding a portrait of her son Nadir Alma (25) one of the victims of the bombing. The AKP’s current and much criticized undemocratic tendencies are not particular to its interaction with civil society. The government’s narrow understanding of democratic values also permeates its relations with the armed forces. This has proven to be disastrous for the surviving families of the Uludere massacre. On 28 December 2011, 34 unarmed citizens were killed as a result of an air strike by the Turkish military. The group of Kurdish boys and young men, the majority of them under 18, had purchased sugar and fuel in North-Iraq. Like most of the males in their villages in Uludere they were engaged in border trade, an officially illegal, but very common and usually tolerated practice. After loading their goods on their mules, the villagers slowly headed back. Approaching Turkey, they were alerted that Turkish soldiers were guarding the border. The group decided to wait in order to avoid the confiscation of their goods. Then, two Turkish F-16s undertook no less than four bombing raids on the unsuspecting villagers. Most of the boys and young men were instantly killed during the attack. The next day, the civilian and military authorities stated that the group had been mistaken for members of the PKK. From the outset, the families of the victims have insisted that the bombing was actually not a mistake and have demanded the prosecution of those responsible. A classified investigation was initiated by the Prosecutor’s Office of Diyarbakır days after the air strike. In addition, a parliamentary subcommittee was formed on 9 January 2012, headed by an AKP-member, in order to investigate if the AKP and the military should be held responsible for the 34 deaths. The civilian and military authorities have until now continued to pass off the bombing as an unfortunate mistake and effectively avoided any kind of responsibility by leaving the most crucial questions unanswered. Who gave the final order for the air strike and on what intelligence exactly was this decision based? The dissapointing aftermath of ‘Uludere’ is the result of the AKP’s and the military’s efforts and has been made possible by substandard civil-military relations. 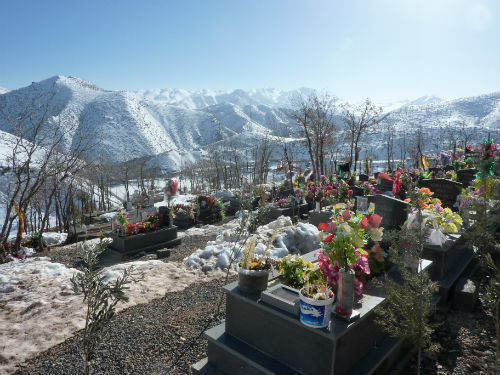 Photo of the mass grave of all 34 victims, located in Gülyazı (Kurdish: Bejuh), the village where most of the victims were from. Directly after the massacre, the government and the General Staff have been acting as a unified bloc. Prime Minister Erdoğan publicly thanked the Chief of General Staff for his display of ”sensitivity” as regards the fatal air strike. The military authorities, in turn, blocked the site of the bombing to NGOs and journalists and refused to disclose crucial information to judicial and parliamentary investigations. The alliance demonstrated between the AKP and the armed forces in the Uludere-case was nothing unusual, in fact, it fits very well in their current live-and-let-live relationship. Since the appointment of Gen. Necdet Özel as Chief of General Staff in August 2011, the AKP and the TAF have entered a new phase of pragmatic unity. The military has adopted an even lower public profile than in previous years and has focused mainly on protecting its autonomy and corporate interests from external interference. The AKP, on the other hand, seems to be satisfied with the outmanoeuvring of the military as a political actor and has given primacy to consolidating state power. However, a peaceful co-existence is not an indication of democratic control over the armed forces. A glance at Turkey’s latest Progress Report reminds us that the military still enjoys a great deal of organizational, judicial and budgetary autonomy and is, as an institution, still not articulated properly within the state system. The military’s judicial autonomy – in particular – has become painfully clear with the ongoing legal aftermath of the Uludere massacre. Due to the existing legislation, the fatal attack by two F-16’s on 34 unarmed citizens can be regarded – legally – as a ‘military crime’ and consequently end up in a military court. Considering the fact that the military judges are a part of the chain-of-command, their independence and neutrality is at best questionable. Therefore, the chances of bringing to justice the civilian and military culprits of the Uludere massacre have become slim to none. The military has managed to keep the Uludere-case within its own judicial system, unhampered by recent constitutional amendments. As a result of the 12 September 2010 referendum, crimes committed by military personnel against the security of the state, the Constitutional order and the functioning of that order are now being judged by civilian courts, instead of military courts. This has effectively decreased the military’s legal protection and further discouraged any interventionist attempts.Yet this specific amendment only concerns crimes committed by military personnel against the government and does not concern crimes committed by military personnel against ordinary civilians. Since its first electoral success in 2002, the AKP has carried out several promising legal reforms that decreased the military’s autonomy and political influence to a great extent. But civil-military relations have generally been guided by rivalry, suspicion and trade-offs, rather than democratic conviction. Especially since 2007, the AKP has prioritized safeguarding it own position over further democratization, building a power base instead of pushing through more thorough reforms that would benefit not only itself but society as a whole. Uludere’s aftermath illustrates that the AKP’s legal reforms need to be accompanied urgently with an unconditional belief in democratic control over the armed forces, refraining the government from capitalizing on the military’s reserve domains [areas of military autonomy] in order to further or save itself – as in this case where the AKP appears to hide behind the military’s judicial autonomy when it comes to ‘military crimes’. The current uprising of civil-society, the much overlooked third actor in civil-military relations, offers hope for the future. On the other hand, the mutual interests of the AKP and the General Staff in hindering a just conclusion to the Uludere massacre create incentives and leverage for future trade-offs between them. Complicating the answer to the most urgent question: how can the ongoing mystification by civilian and military authorities of 34 innocent deaths be stopped?